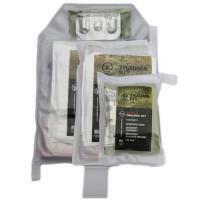 Safariland SONS-FRTK-3 SONS First Responder Trauma Advanced Kit FREE SHIPPING! Be prepared with the Advanced Level SONS First Responder Trauma Kit, designed for maximum efficiency and durability. It's been designed to have the lowest possible profile so you can easily and comfortably fit it under your armor or a ballistics plate without getting snagged. Quickly get at what you need thanks to the full-length ripcord. It has been pressure sealed in medical grade vinyl with precision RF Welding for a completely waterproof seal, also so it will last for 24 to 30 months. This is the same kit successfully used and battle tested by US soldiers in Iraq and Afghanistan. The contents have been organized by injury patterns, following LEFR-TCC protocols. This is the kit to carry if you need to quickly respond to a potentially life-threatening incident. ©2002-2019 CopsPlus.com: Safariland SONS-FRTK-3 SONS First Responder Trauma Advanced Kit FREE SHIPPING!